Okay, you only have a tiny courtyard garden. Or no garden. But you have walls. Walls retain heat, keeping plants alive in frosty winters. 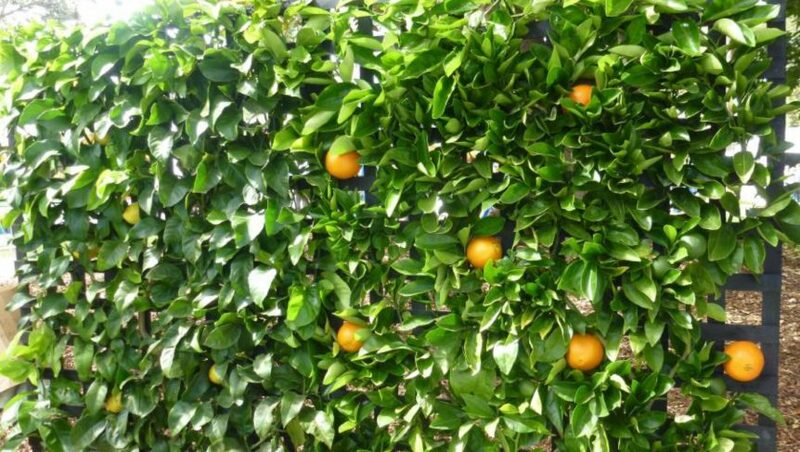 A good sunny wall can even give you a crop of banana passionfruit in Canberra, or, with a really sunny spot, Nelly Kelly passionfruit. Brick or stone house walls store a lot of heat: you can use them as a micro-climate to grow fruit that may not survive in the open garden. Espalier apricots, citrus, avocados, perennial chilies, passionfruit, granadilla, paw paws and other fruit that don’t like late frosts and you will get a crop. You will also get insulation for your home and a most attractive cover for walls. Espaliered apples can look stunning, and give you fruit for at least six months of the year. Espaliered sasanqua camellias – the ones that tolerate heat and light – will give you blooms all winter, if you choose the right varieties for your climate. Espaliering is a form of sculpture you can eat, or at least pick. It is also forgiving. Make a mistake and you can prune it off and wait for a bit heading in the right direction to replace it. And then there are climbers, most of which need something to cling onto. Even if they don’t, a scaffold or wiring of some sort makes removing or taming your Boston ivy or wisteria a lot easier. Cut the wire, haul it away – with a few strong friends to help you – and you’ll take away much of the clinging vine, too. And hanging baskets. I used to fill ours with winter rhubarb, so it grew all year, but we have had a surfeit of rhubarb the last few decades and a few feeds in spring and autumn are enough for us. Hanging baskets of snow peas are more fun, especially if you have kids, though it is unlikely you will get any for dinner – snow peas seem to vanish every time a child passes. Strawberries are best in a hanging tiered strawberry planter, so you get more berries per pot. Plus, of course, there is the ‘salad in a basket’ of Cos lettuce to be picked leaf by leaf, parsley, garlic chives, or even perennial basil if you have a spot where it can survive the winter cold. Thyme, prostrate rosemary and winter savoury (a delicious and much neglected herb) all do superbly in hanging baskets. If you are feeling affluent or energetic, you can buy or make proper vertical gardens for your walls, which suddenly give you a massive amount of cropping space.